How can you tell high quality hardware from junk? Unlike other industries, where 'buyer beware' dominates equipment selection, security door hardware is often tested on how well it actually performs. In this note, we take a look at these ratings, examine how they are applied, and help readers understand how to use them to select the right hardware. ANSI/BHMA Grade 1: Specimens must complete 1,000,000 Cycles without breaking. This class of hardware is most costly, and is usually used in heavy-duty commercial applications. ANSI/BHMA Grade 2: Specimens must complete 500,000 Cycles without breaking. This hardware is usually used in low-duty or light-duty applications - office doors, hallway openings, and side entrances. ANSI/BHMA Grade 3: Specimens must complete 250,000 Cycles without breaking. This hardware is considered 'light-duty', and is typically employed in residential applications but avoided in commercial use. However, if a product carries no grade, this is, at least, a yellow flag that indicates the product failed or has not been submitted to testing at all. The individual test routine varies based on the type of hardware being evaluated, covering the range of lock/unlock cycles, force (strength) ratings, and even plated finish quality. Generally a certification is awarded based on an 'example production' item, and once evaluated the manufacturer agrees that all subsequent items will be manufactured in the same manner, with the same materials, and with no changes to design. However, to maintain BHMA Certification, hardware items are periodically (5, 10, or 15 years) re-tested and evaluated to meet ANSI/BHMA A156 standards. Not all hardware products are 'grade rated', and testing is not mandatory in order for a product to be sold. 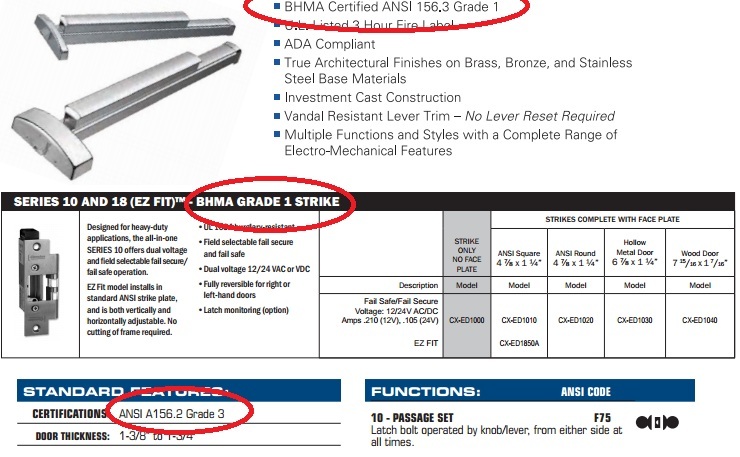 While 'type rating' is often a specification listed in bid documents and RFPs, many door hardware products (especially those in the aftermarket/maintenance market) do not feature any BHMA ratings. This does not always mean this hardware is 'not quality', however it does cast doubt on why a given product lacks a rating. Most 'world-class' commercial security products manufacturers, including ASSA ABLOY, Ingersoll-Rand, and Stanley widely adopt the grade scale and use it to globally rate products. Even outside the US, the ANSI/BHMA scale is the 'defacto standard' for expressing hardware quality. 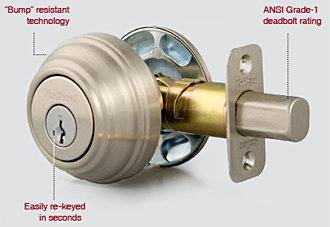 The 'ANSI Grade 1' rating applies to the unit's deadbolt, which is a removable segment and can be used in a variety of products, but the lock itself is not Grade-1 rated. Despite only a portion of the assembly being 'Grade 1' rated, an unsuspecting buyer may assume the entire assembly has qualified as 'top quality', when it has not. Also, when a product claims 'Equivalent to BHMA/ANSI Grade x' or 'Compliant to Grade x Standards', this indicates that a manufacturer has produced hardware similar to a 'rated' product, but has not submitted a specimen for actual testing. The manufacturer may employ a range of testing to internally evaluate a product, but an item can only become truly 'type certified' when submitted to an outside evaluation lab.